Large kitchen bins are perfect for large families and businesses with lots of waste disposable. Whilst we offer large capacity storage for food and home waste, its designed to look stylish, elegant and have a small footprint. The motion activated sensor large kitchen bins help reduce cross-contamination by eliminating the need to touch - It utilises patented motion sensors to open and close the lid automatically. When you need a large kitchen bin capacity, often the options are limited to large affordable plastic waste bins which look cheap and don’t last, or very expensive high end bins. The maxi range is designed to readdress the balance and give you great looks, high storage capacity, the latest in technology and a range of hygienic solutions to waste management without the huge price tag. We believe in affordable quality, and all our auto bins are of the very highest quality. From design to manufacture and distribution, they are each created with longevity and durability in mind. The smart sensor used in the 80 litre large kitchen bins, our largest bin in the sensor dust bin range, works by using infra-red technology to detect motion, This basically means that the bin ‘sees’ the movement of your hand and opens the lid of the bin so you can place the waste inside. You can push the open/close button to keep it open until you want to close it or you can let it close by itself which it will do automatically in three seconds. 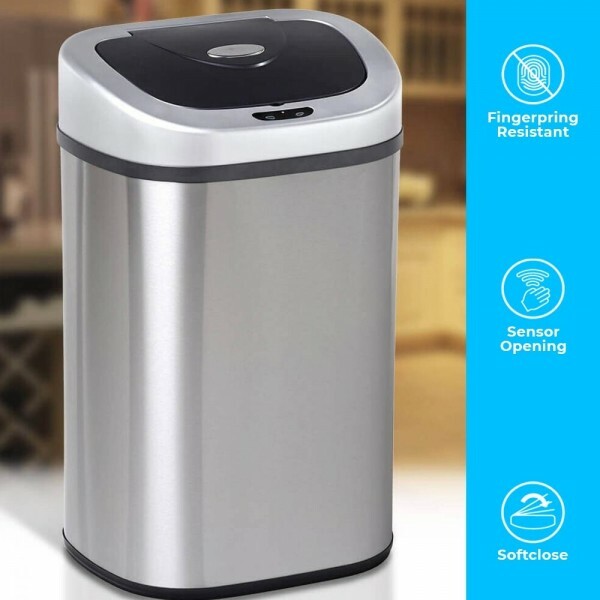 The sensor allows you to deal with the waste more easily (no more juggling rubbish while trying to hold the lid of the bin up) and means that the kitchen waste bins are kept cleaner. 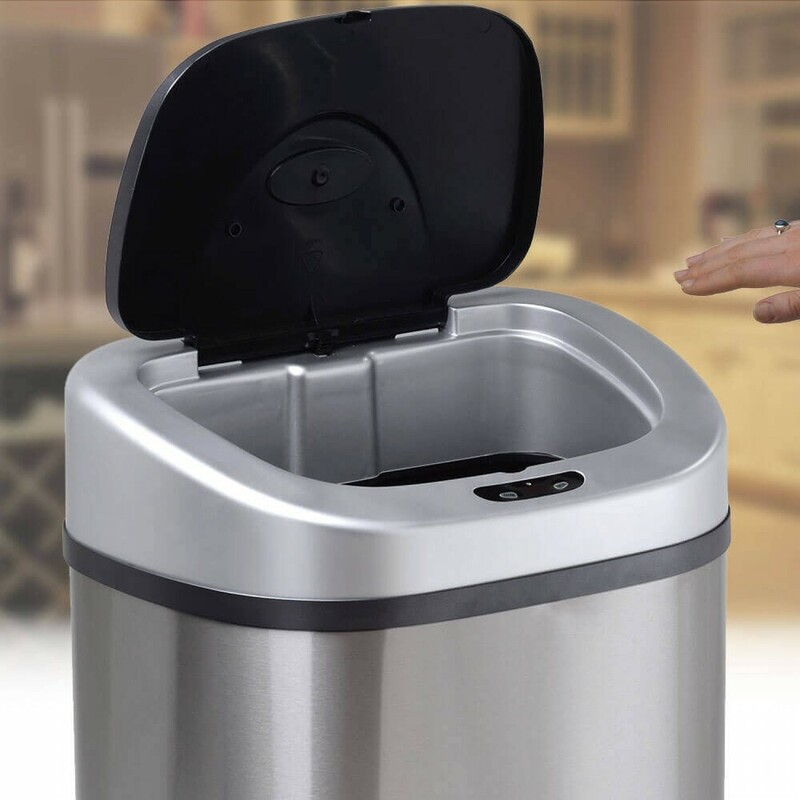 The hygiene of the area around the kitchen waste bins is also better as a result of the touch-less technology – the innovative bag-retaining ring that fits inside the waste bin and works to hold the bin liner securely to prevent any slips, sagging or spills means that the bin is kept neater and tidier. No unsightly bag edges outside the bin – everything is kept tidy and tucked away by the bag retaining ring. Feedback from our customers shows that the bag retaining ring makes a huge difference to how easy it is to change the bin lining bag and many people find they get more waste into each bag too, saving on plastic bin liners. The kitchen waste bins looks as good as they are efficient – the design of the bin is such that it is easy to keep clean. Bins are used to keep your home or workplace tidy, not to give you even more work! Keeping the auto bin clean is easy; the high quality, premium grade stainless steel bin has a brushed finish which resists fingerprint marks and is easy to clean to a streak-free gleam. The head of the bin (including the lid and sensor) is designed to be easy to clean. The ease of use and hygiene implications of the clever design of the 80 litre maxi bin range means it is suited to a wide range of settings; from medical environments to the catering trade. Whether industrial or domestic, the 80 litre maxi bin with auto sensor can really make a tangible difference to the hygiene and efficiency of the environment. Motion sensor using New "Eagle Eye" Technology ™- only opens when you are close by, just above the sensors.